Joson and Aguirre weren't the only ones to capture the eclipse's progression. Astrophotographer Tony Corso combined 10 shots, taken from South Carolina, into a composite that shows Earth's nearest neighbor transitioning from familiar silvery-white orb to shadow-darkened crescent to startlingly ruddy sky sphere. Astrophotographer Tony Corso created this composite image showing the progression of the total lunar eclipse from South Carolina. Zaid Abbadi did something similar, showing the eclipse take hold over Amman, Jordan. Alexander Krivenyshev of WorldTimeZone.com got a great shot of the blood-red moon over the sparkling Manhattan skyline, as seen from Guttenberg, New Jersey. Alexander Krivenyshev of WorldTimeZone.com took this shot of the total lunar eclipse over Manhattan from Guttenberg, New Jersey, on the night of Jan. 20, 2019. Kevin Clarke, observing the eclipse from his backyard near Fort Collins, Colorado, saw the event unfolding against a gorgeous halo in the sky. He managed to get the full effect, after combining images taken with two different cameras and doing a little photo-editing work. "I had been shooting with my Nikon P1000 at around 2000mm, getting great shots of the moon. I noticed the halo and couldn’t believe my eyes. I tried to capture the halo with my Nikon, but it was too wide and the Nikon could not capture the subtle light of the halo," Clarke told Space.com via email. Kevin Clarke captured this composite photo of the total lunar eclipse of January 2019 from his backyard near Fort Collins, Colorado. He used two different cameras and some photo editing to get both the eclipsed moon and the faint halo in the shot. "I ran in and got my Cannon 7D with a 16-35mm f2.8, and it was just able to reach the edges of the halo in the frame. I shot the halo at ISO 1000, f5.6, 10sec so the clouds would have just a little wispiness and movement," Clarke added. "The moon was blown out due to the long exposure, so I replaced it with the fully eclipsed moon shot on the Nikon at ISO 1600, f6.3, 0.4sec. A little Photoshop layering and some basic exposure adjustments, and voila!" And lest you think the Super Blood Wolf Moon was just a Northern Hemisphere event: Yuri Beselsky got a great shot of the eclipsed moon peeking through tree branches in Santiago, Chile — though the weather almost didn't cooperate. "After a week of perfect weather just in the morning of the day of the eclipse, clouds came out of nowhere! It was unbelievable — in the middle of summer in Chile we faced a real possibility to miss the eclipse," Beselsky said via email. "I had some ideas to take wide-field images of the eclipse, but thick high-altitude clouds over Santiago and surroundings made this task impossible. Although the moon was visible, but the sky was not good at all. Walking around, I suddenly noticed a line of trees along the road which had quite interesting tree crowns. Never planned that, but the view of the moon through the trees turned out to be quite intriguing." James Jordan captured this photo of the lunar eclipse from Denver, Colorado. Wes Rabb captured the bright-orange blood moon through tree branches in Winston-Salem North Carolina. Theresa Tanner captured this image of the lunar eclipse from Alberta, Canada. Circling around this “blood moon” photo is a sequence of images showing the progression of the different stages of the total lunar eclipse on Jan. 20-21, 2019. Astrophotographer John Entwistle created this composite using images he captured from the Jersey Shore, where he braved the freezing temperatures and strong winds to photograph the eclipse. Melissa Arrant captured this photo of the lunar eclipse from Lynn Haven, Florida. The moon sinks into Earth’s shadow in this composite timelapse image by Chad Horwedel. He captured the photos from Bolingbrook, Illinois in the freezing cold. 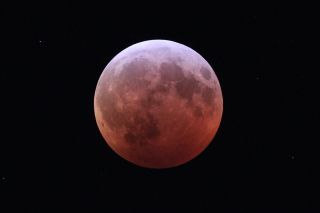 Editor's note: If you captured an amazing photo of the Super Blood Wolf Moon Eclipse and would like to share it with Space.com for a story or gallery, send images and comments to managing editor Tariq Malik at spacephotos@space.com. Space.com managing editor Tariq Malik and staff writer Hanneke Weitering contributed to this story. Mike Wall's book about the search for alien life, "Out There" (Grand Central Publishing, 2018; illustrated by Karl Tate) is out now. Follow him on Twitter @michaeldwall. Follow us @Spacedotcom or Facebook. Originally published on Space.com.